Hypoallergenic niobium hoop earrings put in from the back of the ear. Handmade from lightweight 0.8mm niobium wire by Element 41. These earrings have no catches, the hoop simply threads through the piercing. Please note: Polished/natural niobium is darker than silver. No problem to put in and so comfy you can forget you're wearing them. They can catch on things like towels if you're not careful but other than that nice earrings. I haven't worn anything else since I got these, they are so comfortable. I bought these as I had an infection in my ear piercing that I could not get rid of and cheap gold earrings helped but didn't clear it. These have! My only gripe is that as they are very thin the open end gets caught in my fleeces and I can end up pulling my ear but they are also easy to get off so it's a small problem. They were smaller than I thought but because of the way they get caught in clothes that's actually a good thing. Lovely earrings - as I expected. 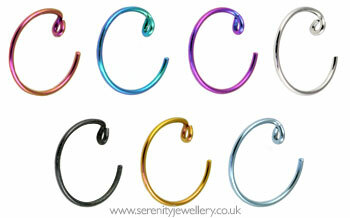 Purchased niobium hoops as I love all the colours and so easy to fit, no fuss at all. Tempted to buy one of each, soon! 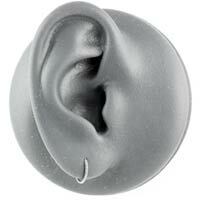 These are very comfortable little earrings. My glasses have a pink template, so I'm wearing pink. They are very subtle, which is what I like. Thanks Serenity! Saturday, 2 November 2013 | Susan. These are my favorite earrings EVER! They go in so easy and stay in. They are very subtle which is exactly what I wanted. My eyeglasses have titanium pink earpieces and the earrings match exactly. I just put them in and leave them. I will be getting my girls some for Christmas! Thank you Serenity!! 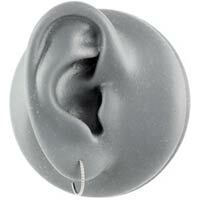 These are unusual, as the hoops are very thin, but I really like this product. I liked the look of these hoops, but they caught on my pillow at night, and I'd wake up attached to it!